Has someone hurt you really badly–and you just can’t seem to heal? Have you forgiven them, but you still sense the arrows of their animosity coming at you day in and day out? 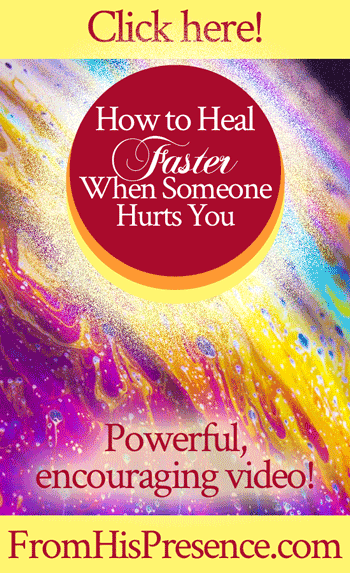 If so, I wanted to share a tip with you today that will help you heal faster–A WHOLE LOT FASTER!–when someone hurts you. This tip totally gets rid of the sensation of other people’s animosity coming at you. True story. Not kidding. That sensation of being constantly attacked by the enemy’s arrows goes AWAY. It really works! I shared this tip in the brief YouTube video below, or you can watch the same video on Facebook here. This tip is something you can do instantaneously, so go ahead and do it as soon as you watch! And after you watch, I’d love to know: Can you feel a difference when you do this one thing too? Leave a comment below! Wow what freedoms comes when we release forgiveness to everyone who has ever spoken death or hurt us in anyway! Thank you for your ministry of love and restoration! You are such a gift to the Body of Christ. Thank you Jamie for that word of wisdom! I’m currently dealing w/ someone who I am struggling to forgive because their behavior continues to reopen the wound. Will definitely apply this practice as I continue to pray. Thank you for your faithfulness to hear & share Father’s heart! Hallelujah ? I’ll be doing this, and do it every day, it feels like while you do this your soul is set free and is cleansed.. Awesome! Thank you for this “nuts and bolts,” hands-on teaching! I appreciate it so much when people give me practical tips how to apply spiritual truth. I have struggled so much with forgiveness, especially when I forgave someone but the feel-good feelings didn’t accompany what I now know was an act of faith by choosing to forgive. I prayed this because I have forgiven over and over and 70×7, and still had that feeling of standing between vipers spitting at me. I am the light because the light is in me. 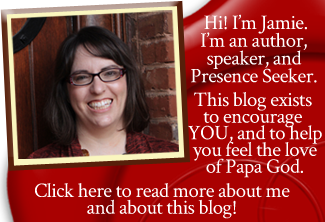 Thank you Jamie for this simple prayer on forgiveness. I thank God for imparting this through you. I pray that God continues to bless you and your ministry. Ms. Pattie, grace and peace to you. I am sorry you are upset with me, as you have said several times before; but the personal situations that you have described to me via email are the types of problems which would benefit from social services, as I previously advised; not from a blogger on the internet. I can and do pray for you, but I cannot fix the problems; you need someone with you in person who can walk you through the solutions to those situations. As far as spiritual or emotional problems go, we all have to do the same things: be transformed by the renewing of our minds, by hiding God’s Word in our hearts and believing it and walking it out. I pray that the God of all comfort would comfort you and encourage you today in all things. Thank you so much for the prayer on forgiveness! This message was right on time. When you talked about the ray of light, sunshine! I actually took a selfie before church Sunday and there was a ray of sunshine behind me. Your message was confirmation. I forgive that guy for hurting me and said the prayer of forgiveness! Praise be to God for you. I needed this! Yes thank you for your faithfulness Jamie. This word is a onfirmation for me. I’m reading this message now & It’s Dec 8 in NZ. This morning as I was driving to work I felt compelled to forgive & be forgiven. I was vocal & strengthened to do so for myself & others in my life currently. God strengthened me throughout the entire day. By the afternoon I wasn’t sure what made the difference. It was my spirit-led morning prayer.Sending out forgiveness of course! Halleluia in Jesus awesome Name! So grateful to you for sharing this Gods wisdom!!! Please pray for my sister Sally to forgive?